sometimes, i'd stop and wonder...where have all my good friends gone? Some of them i haven't seen for awhile because like me, they are busy with work...some has their own families while some have already migrated abroad. i miss them...i remember those days when we just hang out by the school canteen and talk about everything. i miss the days when we would study together at one of our friend's house and make sure that we have tons of food to get us by. LOL...yeah, we are so afraid to get hungry. 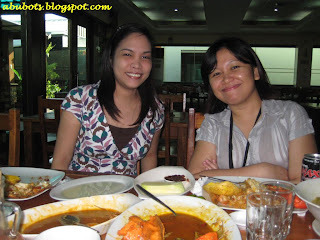 Last week, Joan (my derma friend who's also getting married this coming January) planned to meet for lunch. She had to travel all the way from the province to meet me and Shalee (another doctor friend). Geesh, i really have friends to be proud of. And just not because they are successful in their careers but also because they make sure that we can still hang out once in a while. I had a few hours of sleep but i made sure i'd be able to meet them for lunch. We ate at Dampa Macapagal,a seafood market where you can buy what you want to eat and have the resto cook them for you but we were too lazy to do that so we just went in a restaurant and order food...and let them do the marketing for us hehe. good friends who love good food! and you thought, i'm done eating? HAH! after staying at the resto for almost 3hours (i was late, that's why...sniff) we decide to go to Robinson's Place Ermita to see a movie. 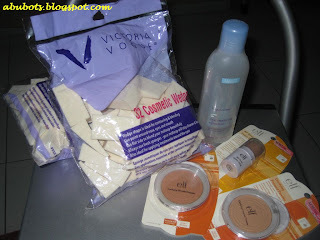 But since Nikki informed me that Beauty Bar there has stocks of sponge wedges, i just knew i had to drop by there first! I also snagged some ELF product and Beauty Formulas eye makeup remover at the Beauty section of their department store. 'twas fun being with you again, ladies. I wish that next time, we'd be complete. I still look forward to having the rest of our barkada with us. 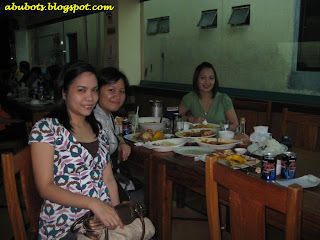 hey sis jheng, great for you to meet up with HS friends, it really brings back memories no? and you are so cute with the pix of you eating the mango! I'm glad you got the wedges, talagang more make up ha? hehehhe *hugs* be ok!!! it's not so often that we get to spend time with each other, gracie..all of us are from the same province but most of us work here in Manila. i don't even get to visit my derma friend regularly when i go home. toink! yeah mhean, i wish i can just go back to my HS days or even college days. i miss studying...less worries unlike now.